The phrase “Silk Road” may once have brought to mind images from ancient history such as pack animals laden with goods crossing deserts, but that concept has now been replaced by pictures of high speed trains transforming China’s trade relationship with the world. In 2013 China’s president, Xi Jinping, announced plans for a New Silk Road, known as One Belt One Road, to link China to over 40 countries. 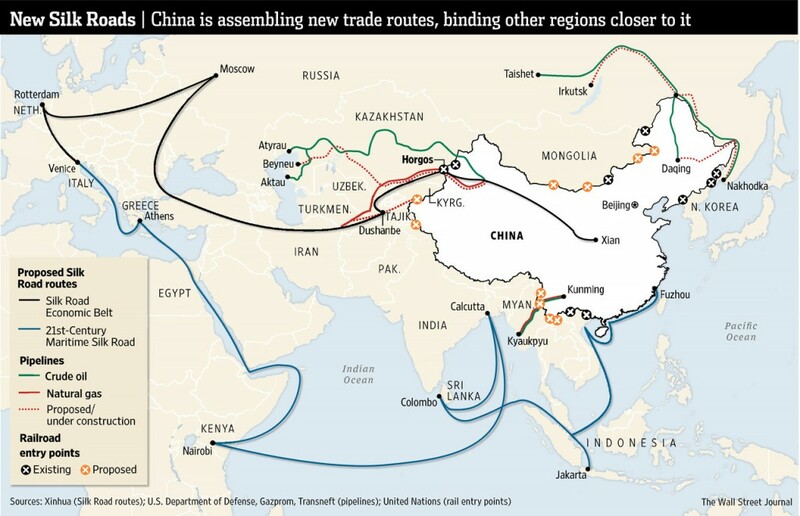 This New Silk Road has two parts: the Silk Road Economic Belt that goes overland from China to Europe through Central Asia, and the 21st Century Maritime Silk Road, which will link the country to Southeast Asia, the Middle East, and Africa along vital sea lanes. The numbers are mind boggling. According to The Economist, Xi plans to use the New Silk Road to lift the value of trade with more than 40 countries to $2.5 trillion within a decade, spending nearly $1 trillion of government money in the process. With that kind of money to spend, few would bet against China making this happen. They are already literally moving mountains to expand cities on the route. It is now possible to transport cargo from Beijing or Zhengzhou to Hamburg, from Chongqing to Duisburg, and from Shenyang to Leipzig (and, of course, back again). These routes are best suited to electronics companies looking to ship high value goods. For these shippers, rail freight hits the sweet spot of being cheaper than air travel and quicker than the maritime routes. As manufacturing in China moves inland in search of cheaper labour (and further away from the ports), these rail routes will become even more popular to a wider range of shippers. Transporting high value cargo across central Asia by train creates two problems. First, the containers have to travel across some of the most inhospitable terrain on the planet and deal with extreme changes of temperature. To make the service viable, new 45ft and 53ft temperature-controlled reefer containers have been developed with a large, integrated diesel generator set that can power the reefer unit for the 14 to 18 days needed for the journey. This opens up the route to a wider range of temperature-controlled goods including pharmaceuticals, chemicals and food. But malfunctions can still happen and the containers need to be monitored to ensure that the correct temperature is being maintained. Second, wherever there is high value cargo, there are criminals. Containers need to be monitored constantly to check for theft and tampering – not easy when they are travelling across the steppes of Central Asia. This is where the Internet of Things (IoT) and machine-to-machine telematics devices come into play. ORBCOMM is already supplying tracking devices and sensors that allow operators to monitor the location, security and condition of their shipments 24/7 and look for temperature changes, door opening and other intrusions. In a recent test case, an attempt to open the doors of a container that was crossing Kazakhstan triggered an alarm that caused a helicopter to scramble to assess the situation. In addition to providing security, these devices can also allow the container temperature to be adjusted remotely. Problem solved? Not quite: the remoteness of this route throws up one more challenge – data transmission. Many of the regions on the Silk Road Economic Belt do not have strong (or any) GSM network coverage. To deal with this, ORBCOMM has developed dual-mode satellite-GSM devices that will automatically switch from default GSM to satellite transmission whenever GSM drops out, ensuring that the cargo can be traced along the whole route, without any black holes. All of this technological excellence will help to ensure that the New Silk Road, like its illustrious predecessor, will drive economic growth and boost trade across the globe. Join ORBCOMM at Intermodal Asia 2016 Conference in Shanghai, 22-24 March, to find out more about the evolution of connected containers. We’re exhibiting at booth B41 and will be talking on 23 March about the “The Internet of Things and the Container Supply Chain: How M2M asset based visibility will change decision making in container operations”. If you can’t be there, visit http://www2.orbcomm.com/intermodal or contact us anytime.